Install in Minutes. Frame Immediately. or do you need site-specific engineering? Diamond Pier foundation models DP-50/50 & DP-75/63 are available for purchase through retail stores as a pre-engineered system. Common uses are decks, covered decks, walkways, stairways, and accessory structures as defined in the International Residential Code (IRC), or similar projects that meet this intent, but Diamond Pier can support a variety of projects. Discover all the ways Diamond Pier will work for your project, and read about Diamond Pier code compliance. Larger Diamond Piers models (DP-100E and DP-200E) are available for more complex projects are available through our special order/site specific engineering option. These models are ideal for commercial application, parks, public works, or large residential projects, discover how to get started with your site-specific engineered Diamond Pier. 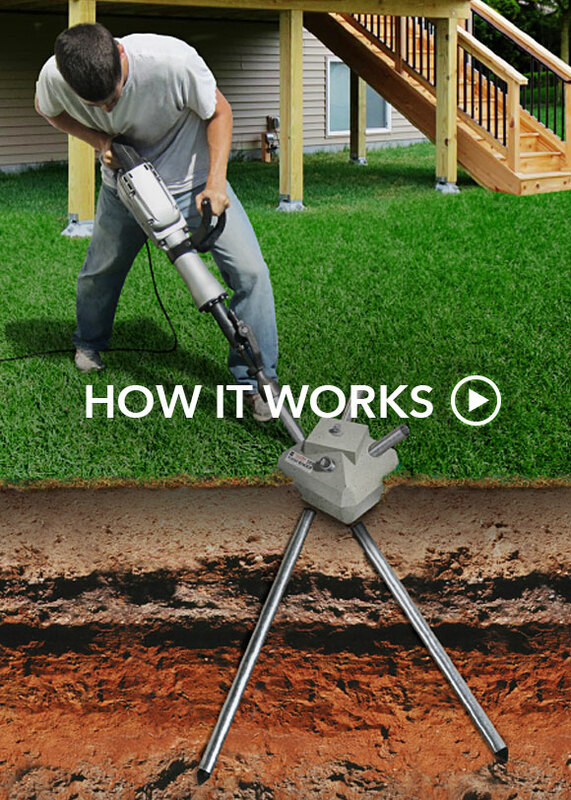 Information on using Diamond Pier foundations purchased through retail stores for building a deck or porch. Information on using Diamond Pier foundations purchased through retail stores for building a gazebo or pergola. Information on using Diamond Pier foundations purchased through retail stores for building a stairway, walkways, or other accessory structures, like an art studio. Information for Diamond Pier foundations purchased direct that require site-specific engineering. Common uses are commercial or complex residential structures like homes, large decks, walkways, solar panels and much more. "Its hard to get away from trusty installation like concrete piers, but I like the product. The cost of a concrete pier vs. a diamond pier is about the same provided your excavation is not full of roots or rocks, if there are underground obstructions the pin foundation will have the advantage. Its going to go in fast and there will be no wait time to start framing so your job is going to move along much faster." "I like the product and they are time saving compared to traditional poured concrete footings. We use DP-50/50 a lot and have just recently needed to use DP-75/63." "We are using the DIamond Pier here in Oamaha Nebraska on new construction as well as old. The builder we do decks for averages at least 600 new homes a year. I'm glad they found you guys. It made life much easier! Especially building in the winter." "I put in probably 50 or 60 in Boston and surrounding areas and never had an issue. They are amazing." "Used 28 under this deck, best system!! Saved time and money." "They worked great! Saved the customer lots of time and hassle by not having to wait for traditional cement footings to cure. Thanks Diamond Pier for creating such an innovative product for our customers." "This is awesome! We redid our 4 deck posts and it took us 3 hours from start to finish. From jacking up the deck, removing the posts and the installation of new footings. I wouldn't use anything else." "10,000 piers and counting. DP has changed the way we build decks. Time and cost savings, ease of install and lifetime warranty makes it a better foundation system." "This is an amazing product… it is incredibly low-impact and very easy to install." "Started with Diamond Pier in May 2015 and they have made a WORLD OF DIFFERENCE to my business opening up an entire new world in terms of revenue!" "… A lifetime warranty on one of the most critical elements of a deck is why my clients choose Diamond Pier." "I’ve been using these all over the west metro area… all the piers have remained structurally sound through repeated frost cycles." "After believing in and selling Diamond Piers for a year and a half now, I personally installed 5 piers in 1 hour 15 minutes total. Amazing product!" "…After Hurricane Dennis AND Hurrican Katrina, not a single Diamond Pier had been compromised." "I’m very impressed with the performance, ease of installation, and no-mess application of the Diamond Pier. I will continue to use them on my future deck projects."